Today I returned home to Whitehorse after a wonderful week of orienteering in the national capital area. The Sass Peepre camp started out with a race in the Gatineau. Day one of the camp came with a massive rain storm. Personally I have never orienteered in rain like that before so footing was very important. The Farsta race was one of my favourite events of the week along with the Chase sprint at Carleton University. My course had two loops with different forking, so there were people running around in all different directions. The map itself wasn't all that big making it even more exciting because there were always people in your vicinity. Much like most Canadians, the majority of my orienteering has been done alone, well what I means is during my average orienteering meet I don't see very many people out on the course. So for me it was challenging but great practice to be able to have to orienteer with all the people running around and acting as distractions. One of my focuses for the race was to run my own race and not to be led astray by other runners and this, I did. The Farsta was a really cool race and a great start to the Junior Camp. During the camp we were all very fortunate to have such wonderful parent volunteers who prepared meals for us after our races and training sessions. Day 2 was a Classic race put on by the neighbouring Loup-Garou Orienteering Club. Unlike the day before, Monday was sunny and warm making it a perfect day for an O-Maze on the beach in the afternoon. Juniors and coaches battled against each other through the intricate maze.The day's festivities were not yet over though, in the evening we all ventured across the locks to the Arboretum. Most of us with our headlamps but not all. A few of the older guys tested their orienteering skills and did the night-O course with only the light of the moon. In this year's camp there was no wasted time. There was no race on Tuesday but that only meant more time for training. After being put into groups we were out for 2 morning sessions and then 2 more after lunch. I learned a lot during these training sessions and it was wonderful for all the athletes to have different coaches working with them. On Wednesday morning the camp was drawing to a close. As per tradition we had the amazing relay race. My team with Magnus and Scott did very well but sadly we wound up just short of the podium. Next year. Then there was the final race of the camp THE CHASE SPRINT. This race I have crowned my favourite race of the summer. I love urban sprints to start with so this event was great because it had the extra excitement component added to it. After the prologue the real fun began. I started out the Chase part as the rabbit being chased by everyone else. It was nerve-racking and exciting at the same time. After our race was over we were able to become spectators and watch the close finishes between the elite men. This finish was great to see with multiple runners in the finish shoot at the same time. The Camp was amazing and I can't wait until next year's junior camp. I would like to thank Anne Teutsch for all the time she put in to organizing the camp as well as all the other volunteers that helped make it such a success. Hello! I’m Emily Ross, 18-years-old, and from New Brunswick. 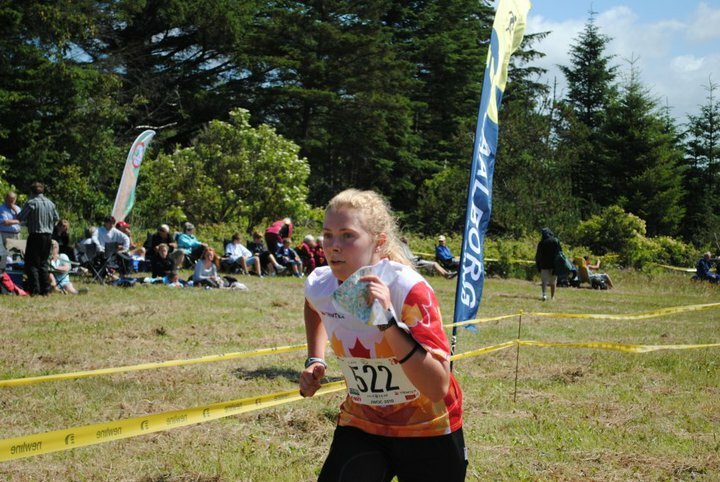 This past July I had the great opportunity to attend the Junior World Orienteering Championships in Aalborg, Denmark as part of Team Canada for the first time. At first I was a little hesitant and nervous about competing at such a high level, but it turned out to be a fabulous experience that made me even more excited to orienteer! As you may know, athletes get to run all the races at JWOC, which made it very orienteering-filled. The first race was the sprint and even though I made a mistake I came back so excited and pumped for the rest of the week. I did not have many goals results wise, so I just focused on trying my best and having fun—something I feel that I accomplished. It was pretty amazing to run the same courses as these orienteering superstars that you hear about. The level that these athletes are at and the dedication that they have is inspiring. At the same time, I feel I had my accomplishments as well, such as finishing the long! And keeping up with Emma Kligenberg from Denmark for a few legs in the middle qualifier (but I made sure not to get distracted when our legs were forked). I found that while I’m not at the level of some countries there are still several runners that I can compare and compete with. Plus, I have new goals and higher hopes for next year. The atmosphere at JWOC is also pretty unique. Everyone is the same age as you and loves orienteering just as much, if not more. While things are serious, there is also time for fun like playing ultimate Frisbee with the Brits and Australians or watching the World Cup soccer games with the Spanish (whose team was in the final). What is also neat is that you run into these orienteers at other large events in the summer, such as O-Ringen. 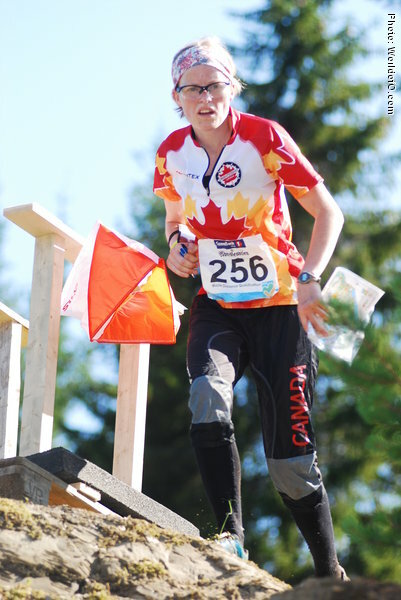 Plus I became a lot closer with the other members of Team Canada, which I feel is really important for fostering the orienteering community within Canada as well encouraging each other with training throughout the rest of the year. And last but not least, running for Canada was pretty incredible and empowering. At the end of the sprint one girl asked me for my autograph (I originally thought that she had confused me with Emily Kemp, but it turned out that she just really liked Canada) and I could hear people cheering for Canada while running through spectator controls and to the finish. Hopefully I’ll get to experience JWOC again next year with even more girls running for Team Canada! I’d like to especially thank Randy Kemp and Jeff Teutsch for their work as team leaders (hopefully we didn’t get into too many shenanigans), Magnus Johansson for his work as national team coach, and Charlotte MacNaughton for her work as COF president. There were so many more who helped me and the team along the way—I truly appreciate everything you did for us! 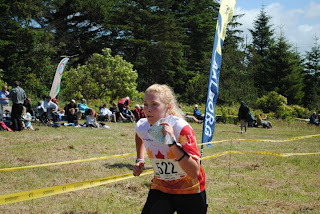 Finally, I highly recommend JWOC for those up-and-coming juniors who want to pursue orienteering. It’s a unique experience and one that you’ll remember for the rest of your life. Here are some photo albums from the World Champs. Click on the thumbnails to see the album. A fantastic World Orienteering Championships is now over. The last day of competition, as always, was the women’s & men’s relay. These races were filled with great performance, high drama, and a few tears. The women were first and Canada did fantastically well. Carol Ross, showing she is maturing quickly ran a strong first leg, keeping her head in the chaos of the mass start. She handed over to Louise Oram in 17th position. Louise showed her growing confidence in her abilities with another strong run (following her great 28th place in the middle distance final) and handed off to Sandy Hott, still in 17th. Sandy, running on almost no sleep thanks to a feverish baby, ran an astonishingly fast race and pulled the team up two positions into 15th. A great result for the team, that will only get stronger as the confidence and experience continues to grow. At the head of the women’s race it was high drama, with Finland and home-team Norway dropping the rest of the teams on the last leg and battling it out to the final control where finally the Finnish runner escaped with an unmatchable final sprint – to win with just a few seconds. Then it was the men’s turn. Canada was led out by Patrick Goeres who ran just 5 minutes slower than the first place teams – handing off to Mike Smith in 22nd place, just in front of Brazil, New Zealand, and USA. Mike ran another good leg for Canada, but was passed by the Irish, Spanish, and Belarus teams, dropping Canada to 25th. Nick Duca ran the anchor leg for Canada, dropping two more spots to Brazil & Belgium, but most importantly keeping in front of the USA to make it a double victory in the relay for the Canadians over the USA! At the front of the men’s relay it was again high drama. The final leg saw seven teams starting within a few seconds. The French were first off, with the Russians just one second behind. The Norwegians, Great Britain, Switzerland, Czech, and Swedish teams were all chasing, less than 15 seconds behind. Gueorgiou for France was pushing hard and soon the lead pack was just France and Valentin Novikov the Russian. They had built a small gap over the chase pack. But just as they approached the stadium the “Curse of Henri” struck unexpectedly – just when it looked as if the French were in control we could see something was going strange on the tracking. Gueorgiou was taking some crazy route to control 17. Then it became too crazy and we all realized he was not going to #17. He had not seen this control and was in fact running toward control 18. A hush fell over the arena as the speaker had to be more silent so that he would not alert the Frenchman to his mistake. Finally Gueorgiou realizes when he does hear the speaker, but by now it is too late – he returns to punch the control but now can do no better than 8th place, while Novikov finishes comfortably in first place. The battle for the other medals is won by Norway, and with Merz out-sprinting Fraser (GBR) to win the bronze for Switzerland. For the fans it was tragic to see Gueorgiou miss a relay medal again – the third time running. Two years ago he was stung by a bee when he was leading with just a few controls remaining; last year (I hope you all remember) he lost a medal when he stopped to help an injured competitor, and now for the third time in a row something bizarre stops him from winning. As the arena announcer said, “Perhaps WOC Relay is not Gueorgiou’s cup of tea”. Congratulations to the organizers and to all of the competitors. It was a tremendous week for orienteering. The event set new standards in live coverage, and the atmosphere was superb everywhere. And for me it was very inspiring – I had a blast running in the public races. What a great sport when I get back from my own race, bleeding, sweating like crazy, and covered in swamp mud, and all I want to do is go back out for some more! Middle F - Louise breaks into top 30! Louise Oram ran a scorching race today in the Middle Final to finish tied for 28th! On the live tracking we could see that she took the first three controls very quickly and it looked as if she was about to catch up to the French runner who started two minutes in front. But then it seemed that Louise was fighting with her compass, and so instead of catching the runner in front of her, instead she dropped some time and was caught by the Polish runner who had started two minutes later. At this point things could have gone either way - but Louise seemed to settle in, and she had a fabulous middle section of the course, storming around the rest of the course and moving up into the top 30. A truly superb performance – and still room for improvement! In the photo you can see Louise running in towards the arena for the spectator loop. The atmosphere in the arena was fantastic again. Amazing coverage on the big screens, TV splits from the terrain and continuous GPS tracks kept the excitement up throughout. In the women's race we could see Simone Niggle make a critical mistake on one of the last controls on the GPS and how Minna Kauppi explored the opportunity and took the Gold. For the men, it was a breathtaking battle of seconds, where Carl Waaler Kaas from Norway beat out Peter Öberg of Sweden with 7 seconds. Here is a little video clip showing Kaas run in the finish chute. It's going to be an exciting day! WOC Middle Final: Time to Rock and/or Roll! Tomorrow Louise Oram steps on to the forest of battle to show those Euros a thing or two about how to orienteer. The weather is anticipated to be deceivingly warm, around 20 degrees with a strange tendency of the clouds to never cover the stadium, which my massive sunburn can attest to. Louise starts at 13:22 Norway time, which is in the +1 GMT timezone. She starts mid-pack, a great place with plenty of people in front of her and strong contenders behind her. Live tracking and streaming is available for 90 NOK from the WOC website, or live results for free also at woc2010.com, just click on "live centre". We also recommend worldofo.com's live blogging, get in to the action and chat with other O-fans, or hit attackpoint's discussion on the race. The Canadian team will be out in full force and we know Louise will do really well and make us all proud, and hopefully, more importantly, herself proud. Words to live by. Go Louise! The Long Qualifier took place late this afternoon, again at the Jervskogen ski-stadium. As the race started, the men's course was shown on the big screen in the stadium and we could see that the runners would face some serious challenges out in the woods. Courses started with some difficult controls in the green, just like yesterday, followed by some fearsome looking long route choice legs, steep climbs and detailed navigation. First out for the Canadians was Sandy Hott with a very early start. She was reported from the intermediate time as having lost some time to the leaders, but when she came in at around 55 minutes there was a feeling that she might have a shot. Sandy reported that she had a pretty good race, but had struggled a bit to keep focus and direction on the long legs. After a long wait for the entire field to finish, it was finally clear that Sandy barely missed the final again with a 16th position. This time only 13 seconds out... Carol Ross and Louise Oram both ended up with a time of about 62 minutes. Carol had some trouble early on the course, leaving the first control in the wrong direction, forcing her into a much slower route to the second. Louise was hanging on to the last qualifying position halfway through the course, but lost her direction when attacking a control and lost too much time relocating. On the men's side, Nick Duca started early, and came to the finish reporting some hooks and hesitations early in the race. Mike Smith had a bigger mistake at the 3rd control, dropping around 4 minutes, so the last hope for Canada was Patrick. He started second last and we were waiting nervously at the finish as the clock was ticking. Patrick came charging in to the last control as his time was running on 68 minutes and he was a few minutes on the outside, even though he had the best time of all the North American men today. The Canadian team will now recharge for the weekend action, running some public races and watching the Long Final on Thursday. Louise is running the Middle Final on Saturday and then there is the Relay on Sunday. Stay tuned in! Middle Q - Louise made the final! The Middle Qualifier took place this afternoon at Jervskogen, about 45 minutes east of town. The arena was at the ski stadium and the big-screen coverage was pretty sweet, with GPS coverage of the women's heats. The finish chute was a steep downhill bank right in front of the spectators. It was clear right from the first finisher, a Norwegian runner, that the times were very fast, about 23 minutes for the fastest men. However, there were also big mistakes being made. The courses started up across a bland green hillside which caused plenty of trouble and then went up high to some open forests with marshes and detailed contours. Louise had a very steady race with only some small hesitations and little hooks and come in on a very good time. We had a feeling right away that she was going to make it and it turned out she qualified in 9th. Super solid! Unfortunately, margins were on the wrong side for Sandy, finishing in the dreaded 16th spot, less than 30 seconds out. Carol had a mistake on the first control in the green and had a few more problems out on the course. She finished outside of the final spots, but was not too far off anyway. She would have qualified with a cleaner race. The running speed is there! For the men, it was a difficult day. Wil had a pretty good race technically, but felt he was too cautious in the beginning and lost too much time in the running. Mike had the running speed to qualify, but dropped around 6 minutes in mistakes, which pushed him out with no chance. Patrick also had a hard time and decided to abandon his race. But the next chance is already tomorrow in the Long Qualifier! The Canadian team is Nick Duca, Mike Smith, Patrick Goeres, Sandy Hott, Carol Ross and Louise Oram. The Sprint Qualifier took place this morning at Sverreborg, just outside downtown Trondheim. This was a very cool place for a sprint, with an old ruin "fort" from the days of the vikings, mixed in with some forest, village of old wooden houses and some modern residential areas. The start was right next to the arena and it was interesting to see the different route choices to the first control for the different heats. Many runners got pulled off towards the wrong fork right at the start triangle! The Canadian team did not have the best day. No runner qualified for the final, taking place in downtown Trondheim this afternoon. Will Critchley had a strong run in Men's heat B, only about 50 seconds out of the qualifying time with a fairly clean run. Louise Oram also was about 50 seconds out with a good run. Just a little bit of speed missing. Carol Ross had a great start to her race, but made a bigger mistake just at the end of the course. Patrick Goeres also had a bobble on a control in the forest, but his speed probably wasn't enough today. Jon Torrance also had a good race technically, with only a route choice mistake, but the speed was not quite there. It's now time to recharge for the Middle Qualifier tomorrow! The Canadian Team is Louise Oram, Carol Ross, Sandy Hott, Patrick Goeres, Mike Smith and Wil Smith. WOC in Trondheim is about to start and the Canadian Team has settled into our luxurious downtown residence. Today was the Sprint Model, literally one block from the hotel. Everyone is in good shape, well rested and itching to go. Stayed tuned to our blog to follow the progress during the week. Sunday is the Sprint, Monday is the Middle qualifier and Tuesday is the Long qualifier. O-Ringen Day 4 and 5: Its O-ver! I thought it necessary to do one final quick blog post about the last few days of O-Ringen. WOC will be starting up soon, so there will be plenty more news come tomorrow and in the future, so this is the final wrap-up on O-Ringen. Mother Nature clearly felt that everyone was enjoying themselves too much, what with the nice weather for day 3 and the rest day (illustrated by the impromptu ice cream party with Ireland) and decided to bring the rain back for Stages 4 and 5. The campground rapidly turned into a swamp, and everyone finished soaking head to toe, not necessarily from the rain but from the very damp forest. Day 4 was long-ish middle distance style race, in a very nice pretty fast forest, with some steep steeps and some flat flats. Everyone had a generally solid race in this terrain, so, oddly enough, there's not much to say about it. Perhaps Swedish terrain is now becoming old hat for us all! And the rain, well, we were all pretty much resigned to it at this point. Day 5 brought a nice respite from the rain for racing time. The sun briefly came out, with some occasional showers. The evidence of rain was most obvious today, as the small blue lines marking streams on the maps were full blown rivers, marshes were more like lakes, and I can personally say I was hip deep at one point. I daresay if Carol found this particular marsh she may need a life jacket. However, this deep deep water clearly didn't affect Carol much, as she pulled out the performance of the week, placing third on the day in D21, running alone most of the time and destroying several hundred Swedes. Robbie Anderson also had a great final result, finishing 24th overall in a massive H21 class. Overall, everyone did pretty darn amazing, and had at least one or two good races, and I'd say we all did Canada proud. If you've never been to O-Ringen, I highly recommend you do it at least once. It feels like a fundamental experience for any orienteer. And, we'll leave you with Carol's final thought of the week: "I love orienteering in Sweden! Though I would appreciate it if it would stop raining."